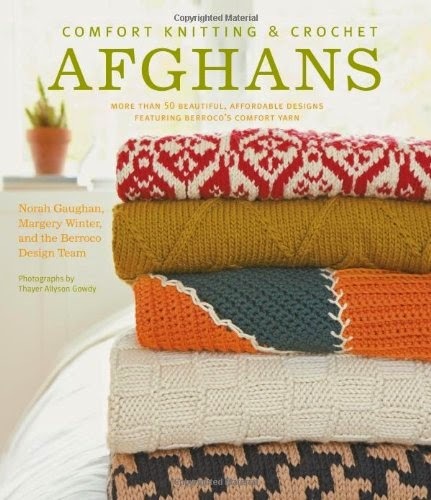 Author: Norah Gaughan, Berroco Inc.
For many of us, afghans are the epitome of comfort. Colorful and inviting, they are a staple of the home, without which a living room or bedroom just wouldn’t feel complete. And whether you’re making one for yourself, as a housewarming gift, or to welcome a new baby into the world, the process of creating a handmade afghan can be as rewarding as the finished product. Comfort Knitting and Crochet: Afghans features 50 patterns for these cozy blankets, made with Berroco Comfort yarnan affordable, ultra-soft acrylic/nylon blendand designed by the Berroco team, headed by Norah Gaughan. The book includes something for everyone: The designs range from ultra-modern to traditional, from spare to embellished, and are inspired by sources as varied as Scottish tweeds, Japanese Ikat, and Delft pottery. Intended for knitters and crocheters of every skill level, this collection brings new life to the well-loved and versatile afghan.